Technology is great, especially when it all works together, but sometimes it's not particularly seamless - enter the Neptune Suite. We've already covered the details of the Neptune Hub wearable, which houses all the processing power and smartphone smarts in a wrist cuff and beams it to a dumb mobile screen when you need a bigger display. The firm's Indiegogo campaign is now live and it's announced further peripherals including a 10-inch tablet screen with Bluetooth keyboard dock, wireless Bluetooth headphones which double as a charging cable and a Chromecast-like HDMI dongle that can be stuck in a laptop, computer monitor or television. 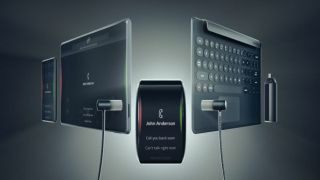 The idea here is you'll only ever need one smart device - the Neptune Hub on your wrist - with the "dumb" screens of varying sizes giving you a variety of different use cases for the Android operating system. All your data and connections are made through the smartwatch, ensuring you always have access to all your files no matter what you're viewing it on. There are some obvious concerns, chiefly surrounding battery life from the 1000mAh power pack in the Hub, but the power hungry screens sport their own batteries which takes the pressure off the watch a little. Another potential issue is storage, although the Neptune Hub does come with 64GB of space which should be enough for most users. The firm is offering up the Hub, 5-inch Pocket Screen, 10-inch display, keyboard dock, headphones and dongle for an early bird price of $599 (around £400, $780), which is at least an awful lot of tech for the money. There's no firm release date for the Neptune Suite, but we're told the Suite should be ready for backers by January 2016. You can find out more about the Neptune Suite in the video below.